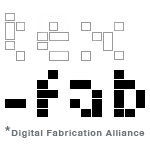 TEX-FAB 2015 will be in Houston March 26-29. 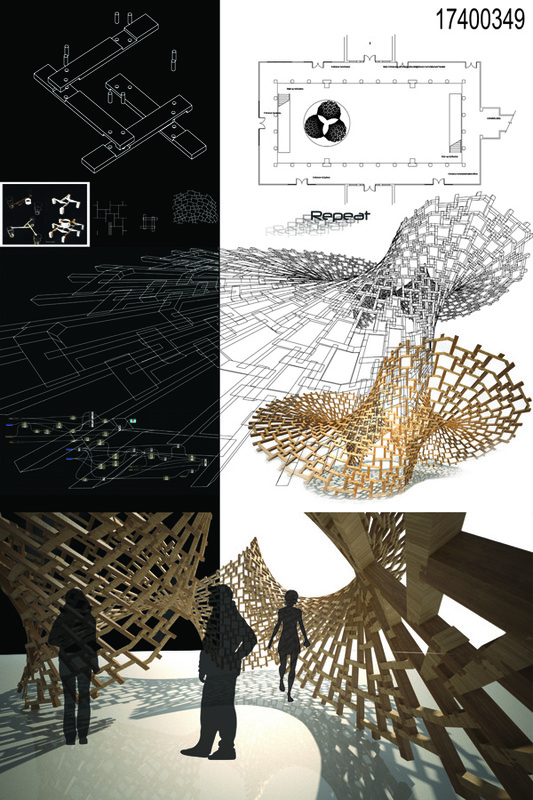 Workshops seats still available on a limited basis. 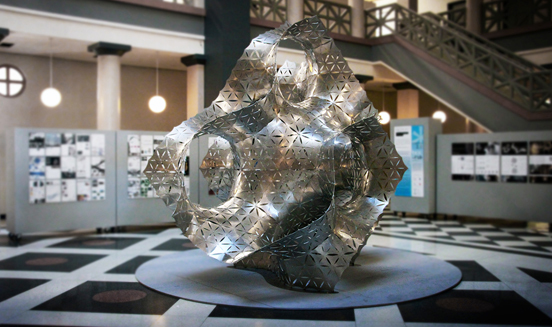 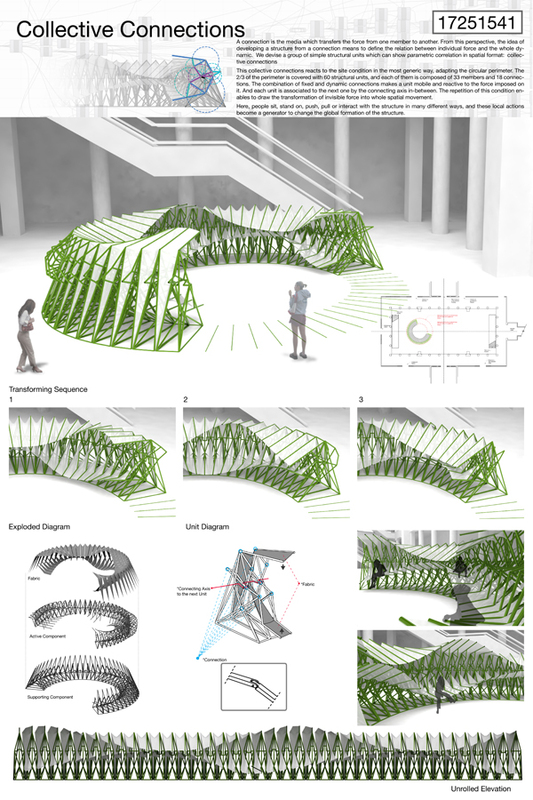 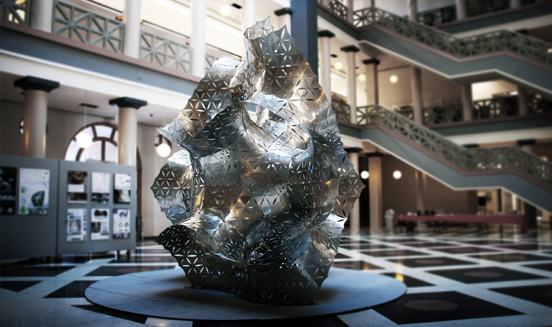 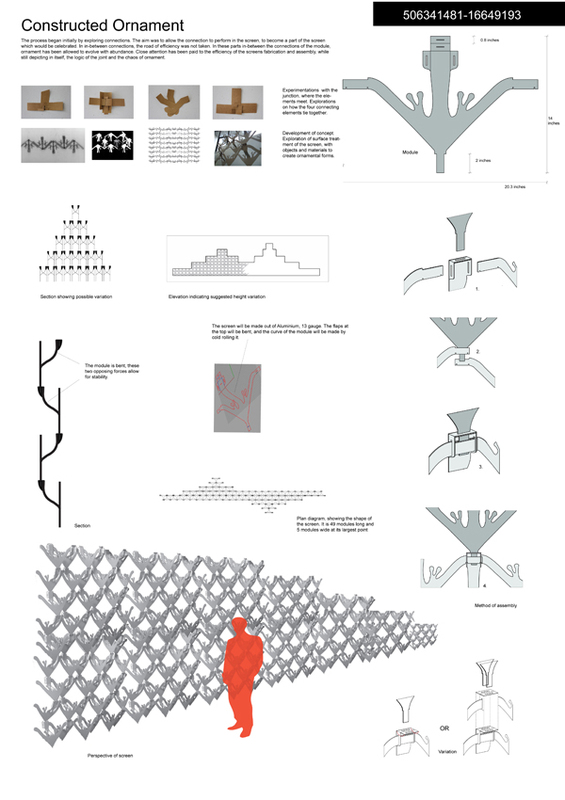 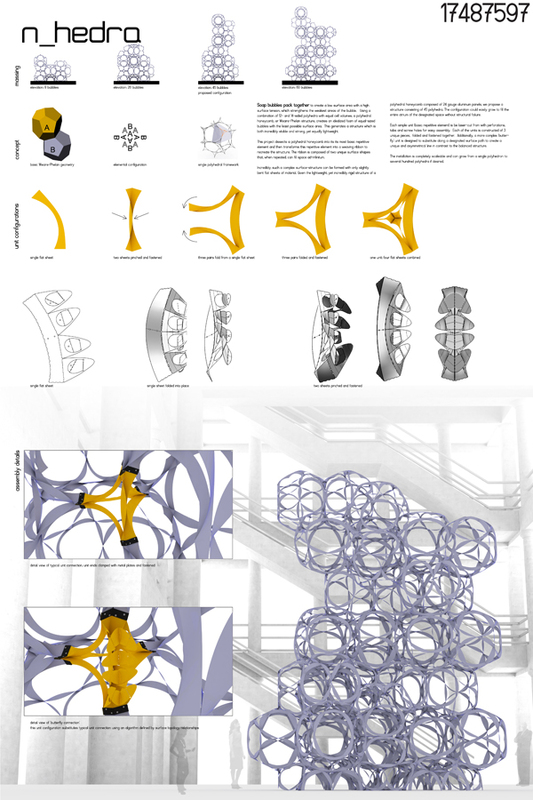 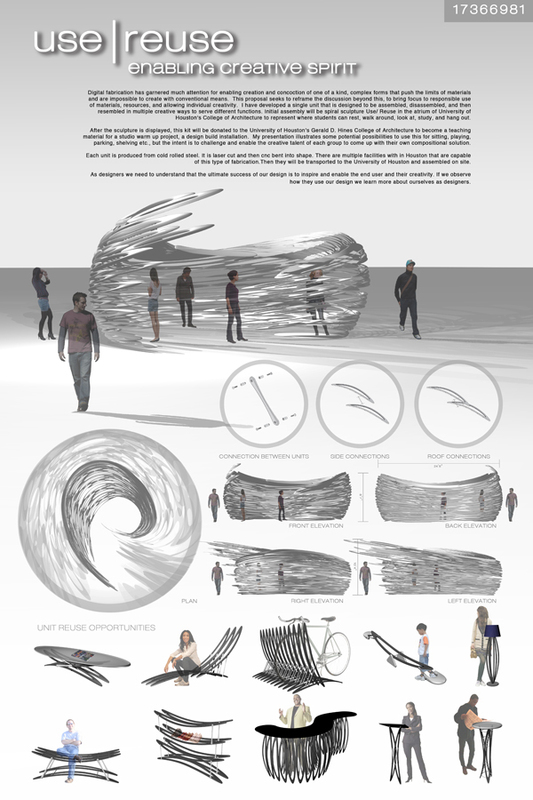 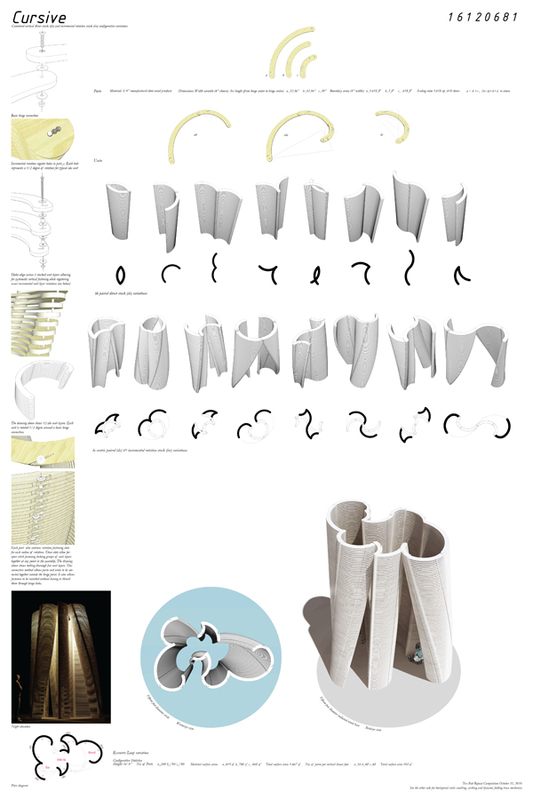 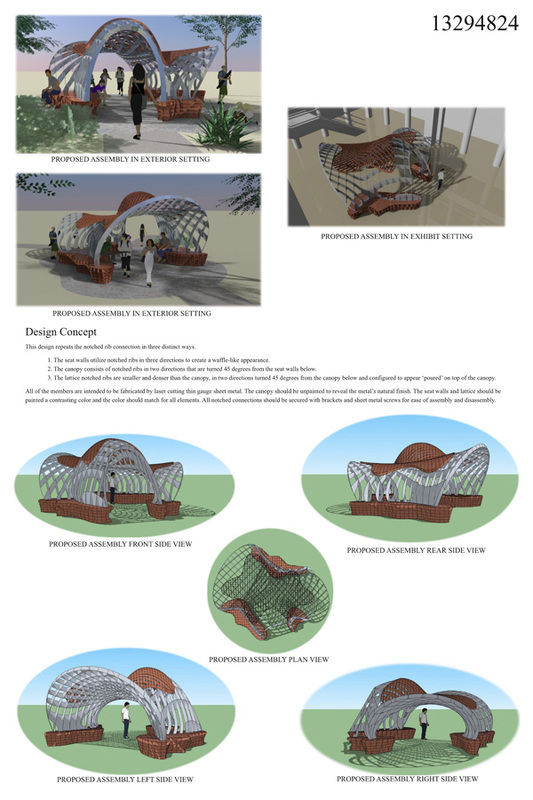 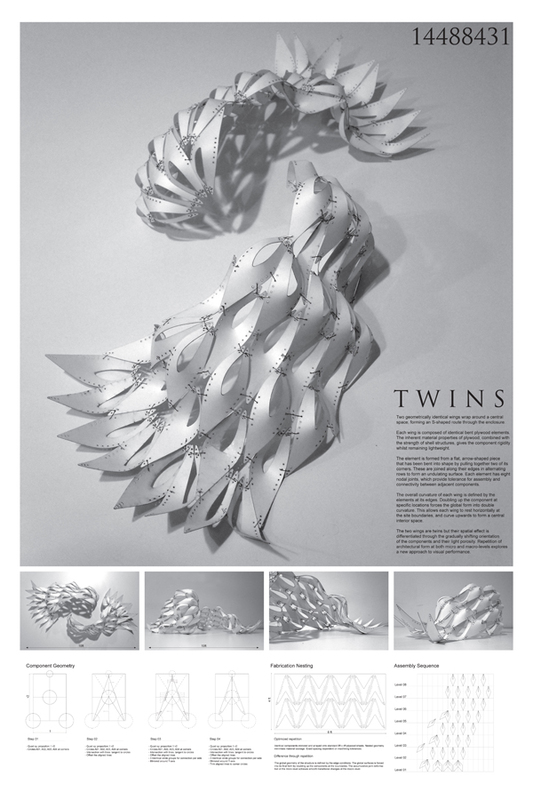 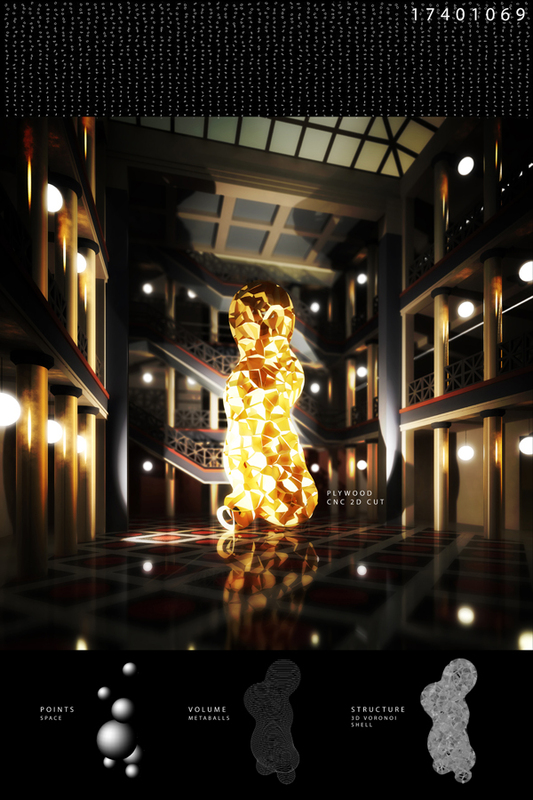 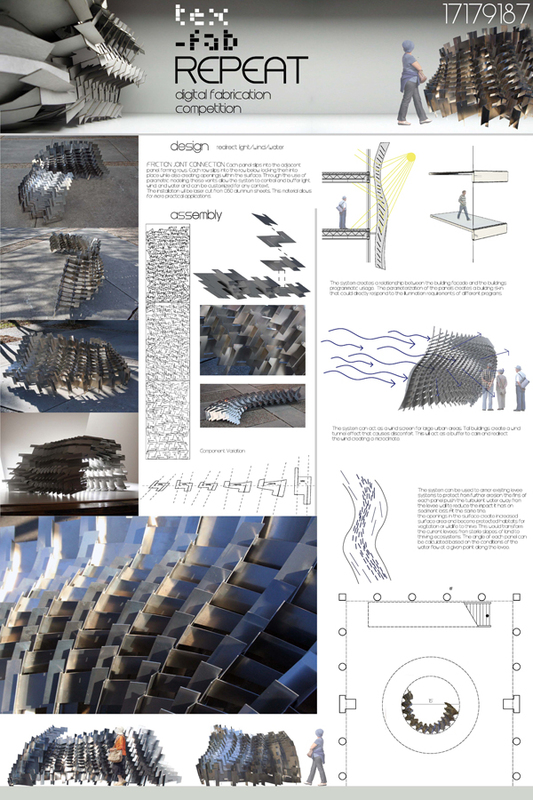 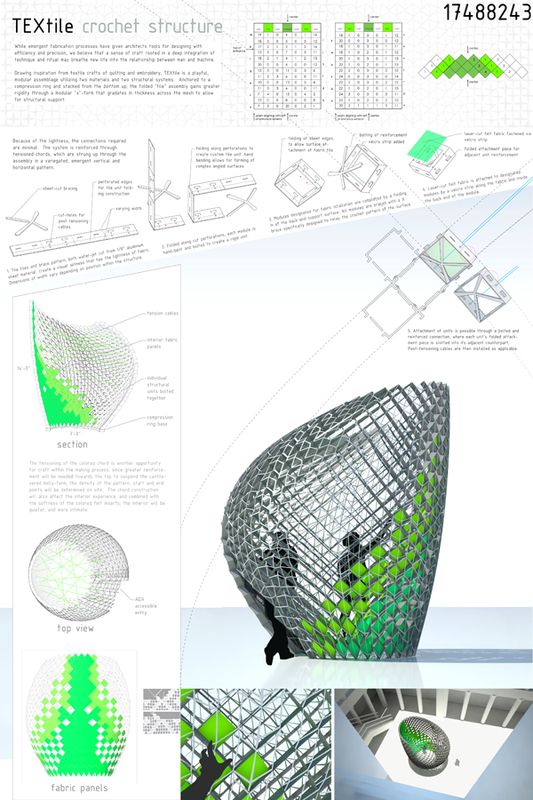 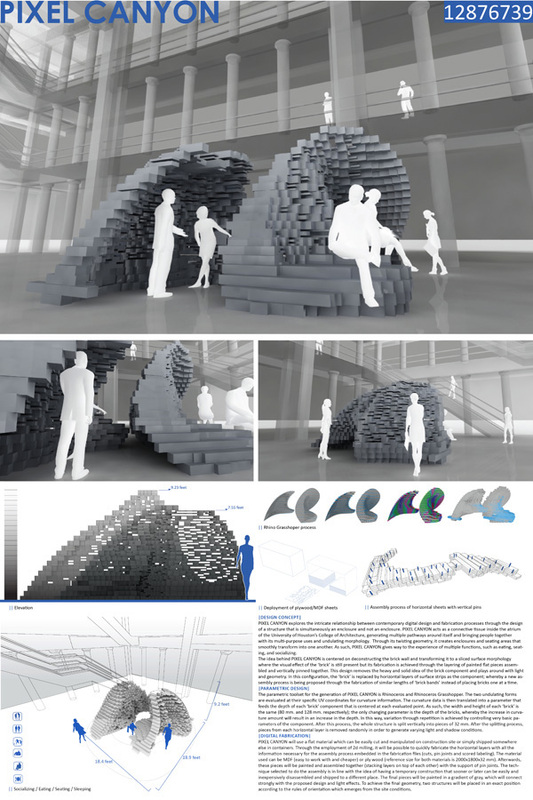 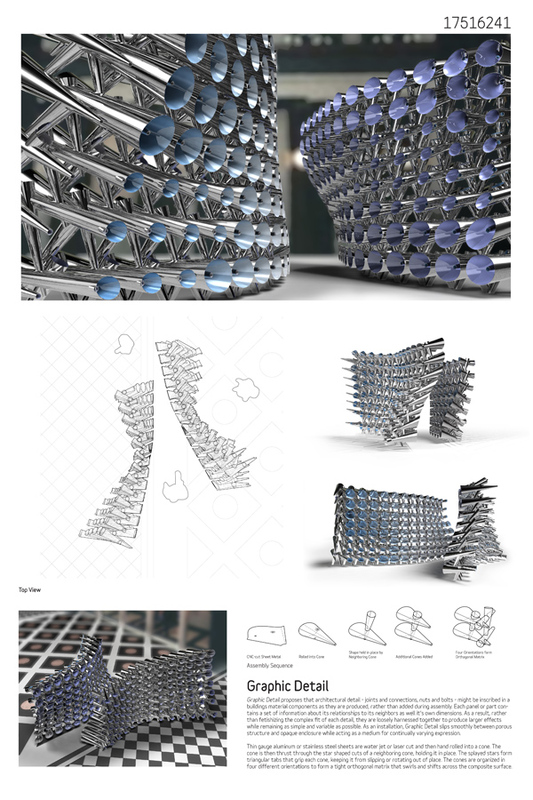 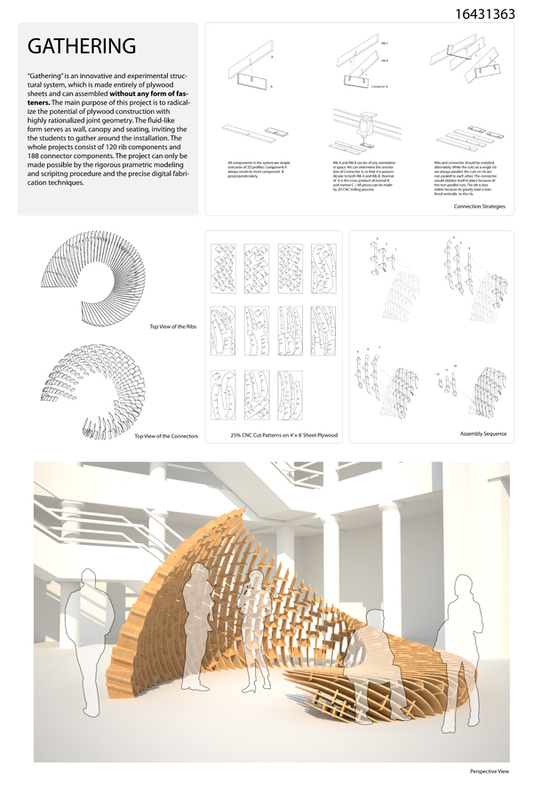 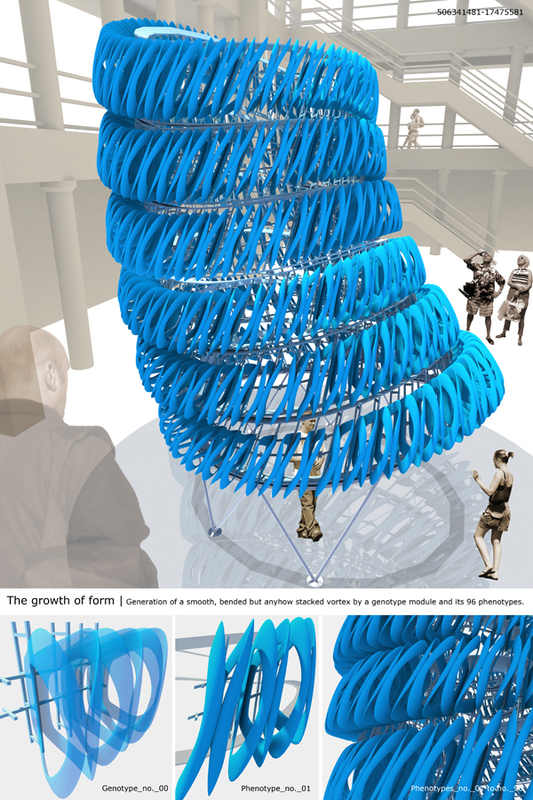 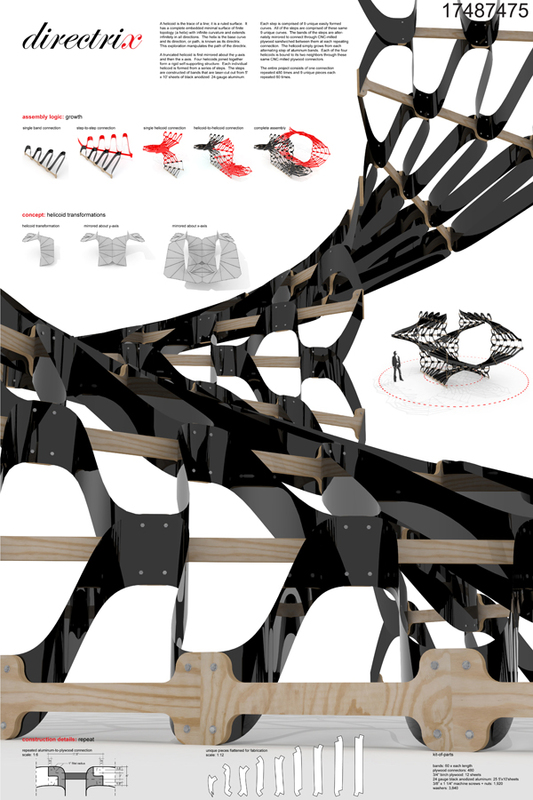 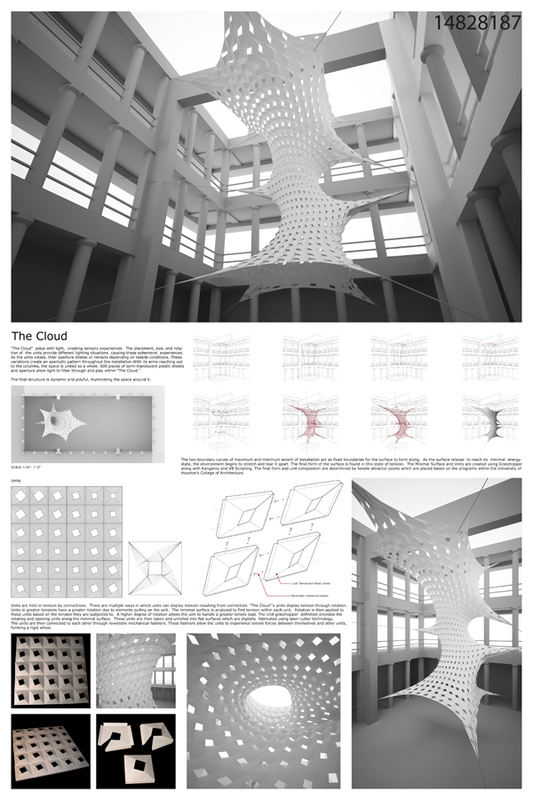 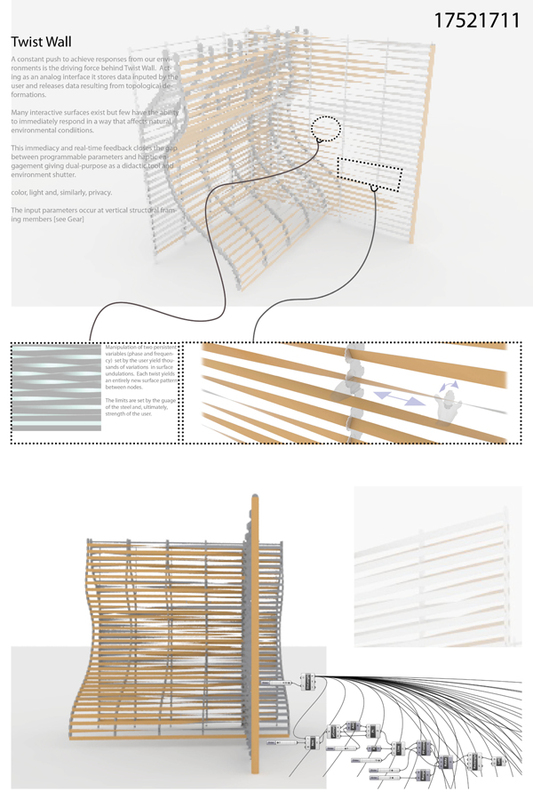 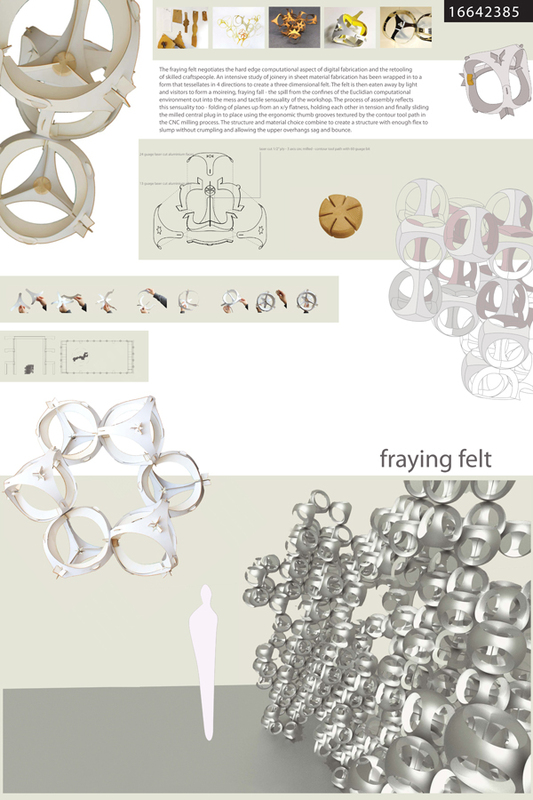 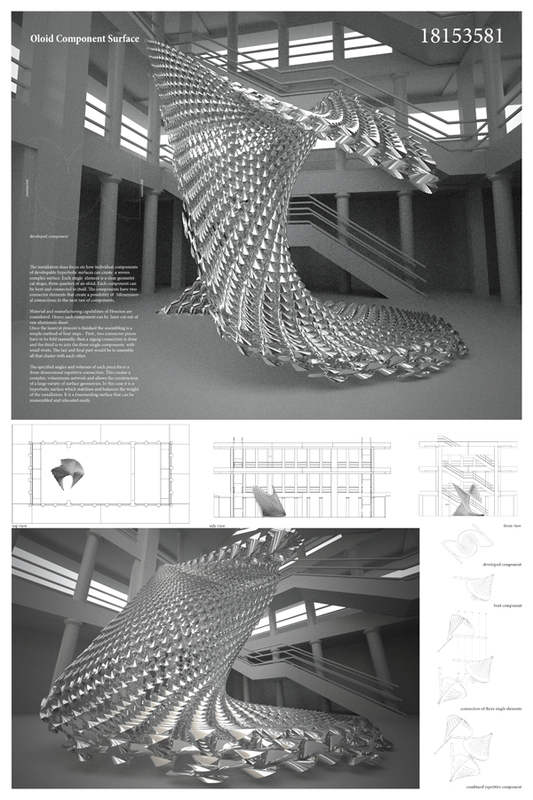 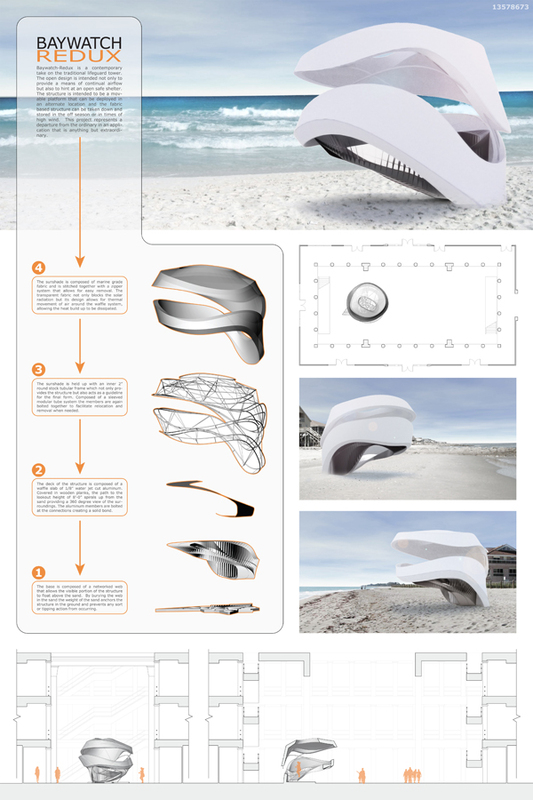 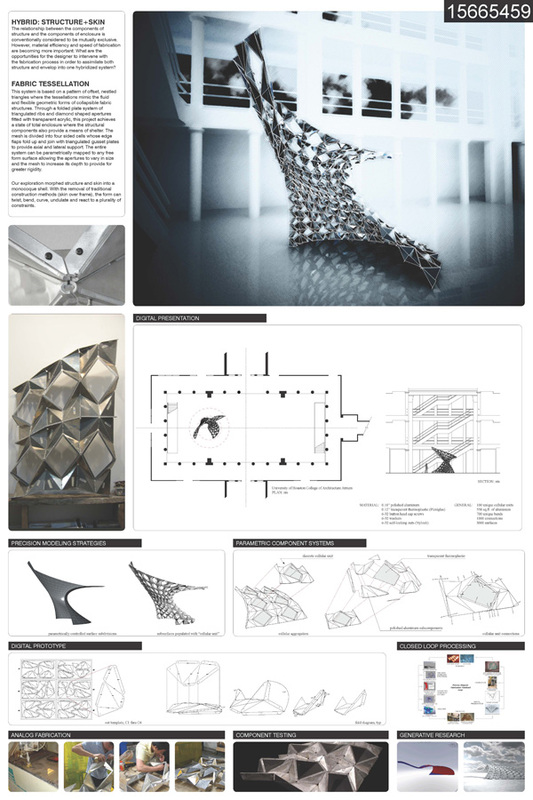 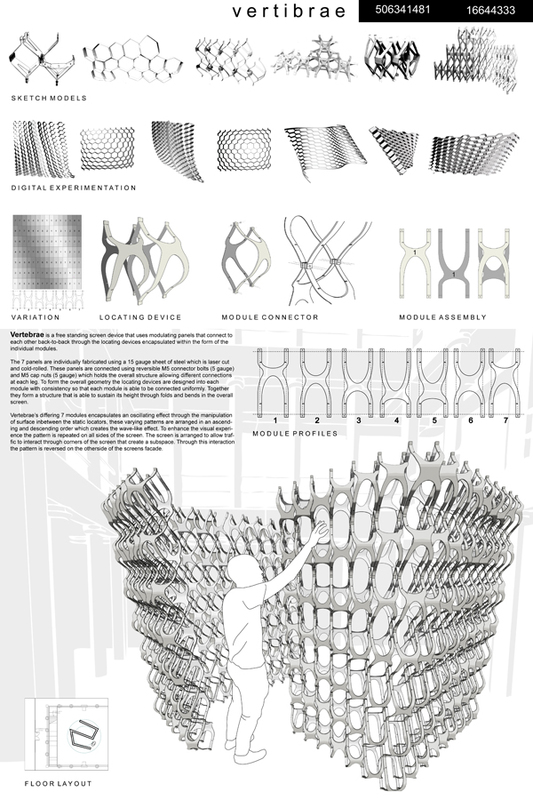 We are pleased to announce the winners to the TEX-FAB REPEAT Digital Fabrication Competition. 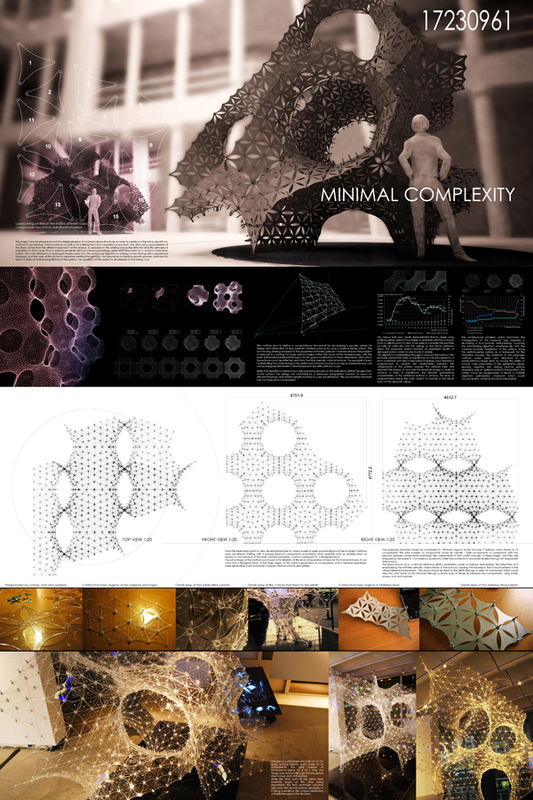 We received a total of 73 entries from across the globe representing 18 countries on 5 continents. 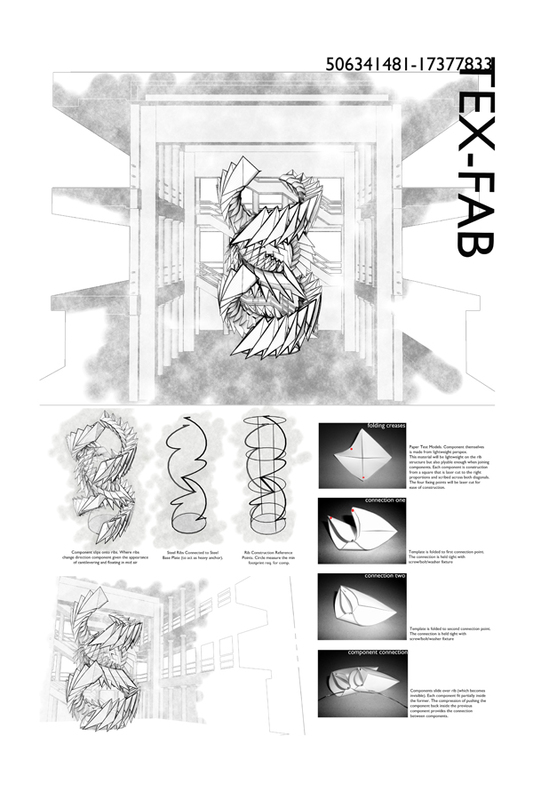 The jury consisting of Patrik Schumacher, Marc Fornes, Lisa Iwamoto, Chris Lasch and Blair Satterfield conferred and decided that the winning project that will be built for the TEX-FAB Event in Houston in February 2011. 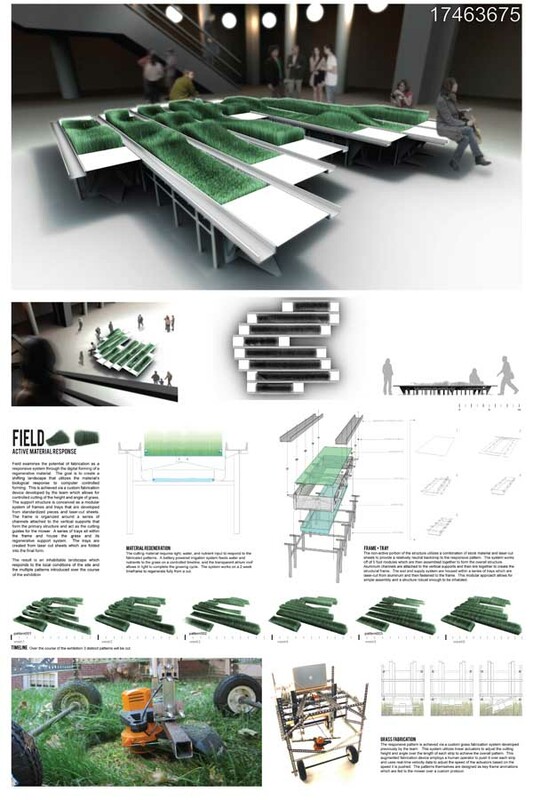 Of all the entries the Jury selected 1 Winner, 4 Runners-Up and 7 Honorable Mentions which will be exhibited along side the winner. 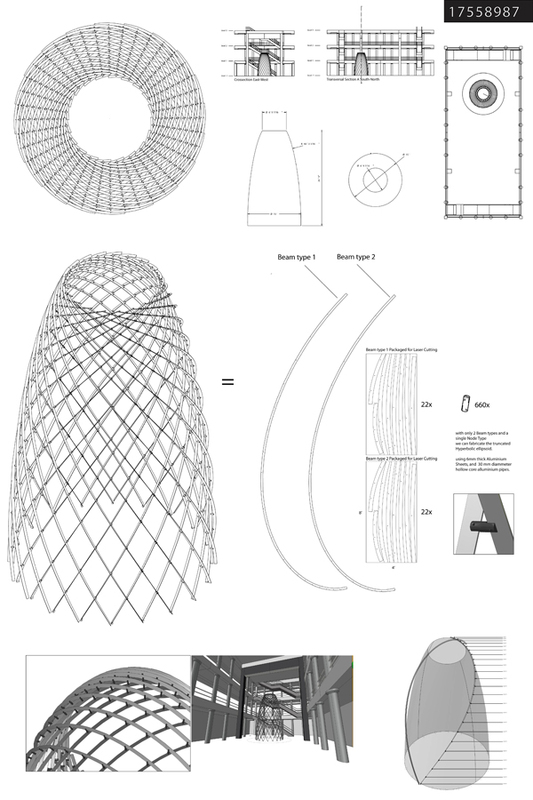 Along with its aesthetic beauty, technical superiority and elegance of detailing, the proposal was chosen because it employs structural robustness, material efficiency and an inherent logic of assembly. 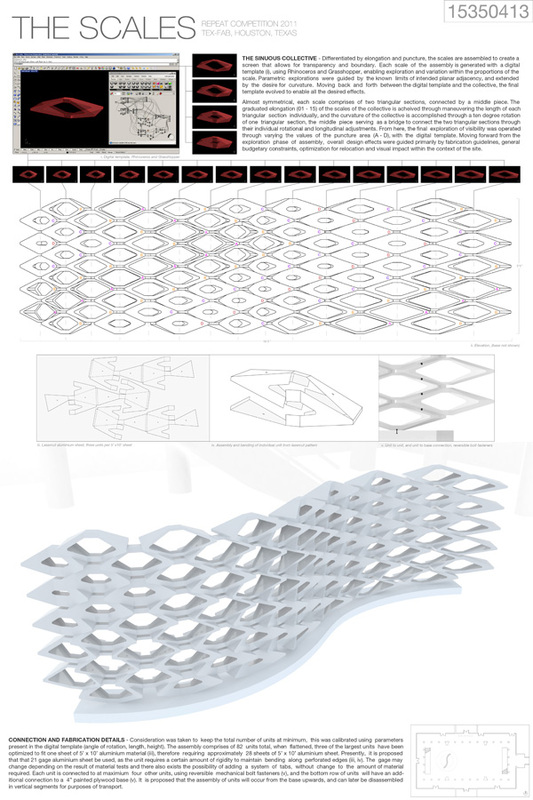 A minimal periodic surface structure is created with the repetition of only 16 different components. 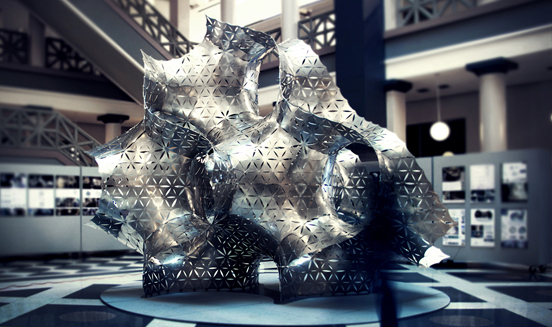 A macro-scaled modular cellular pattern emerges through symmetry that is infinitely expandable and open-ended while becoming differentiated at its edges. 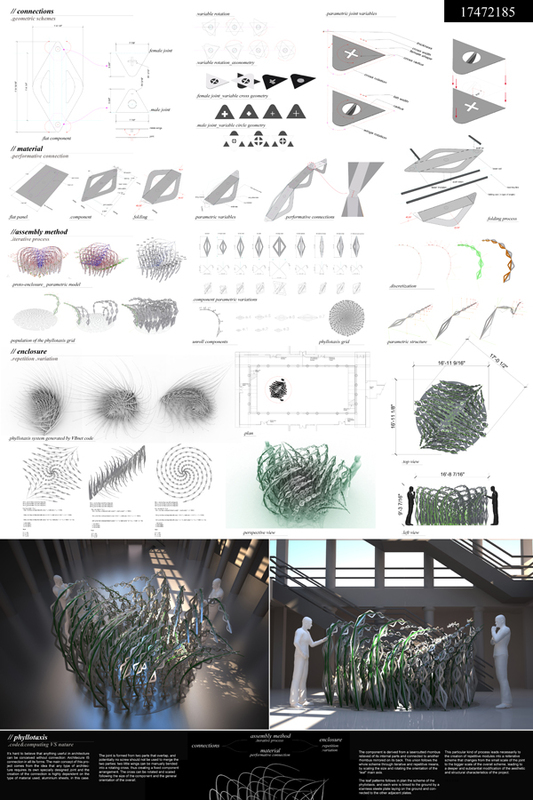 TEX-FAB invited five leading figures in the world of digital fabrication and parametric design to jury the competition with a global understanding and presence within the digital design and fabrication communities. 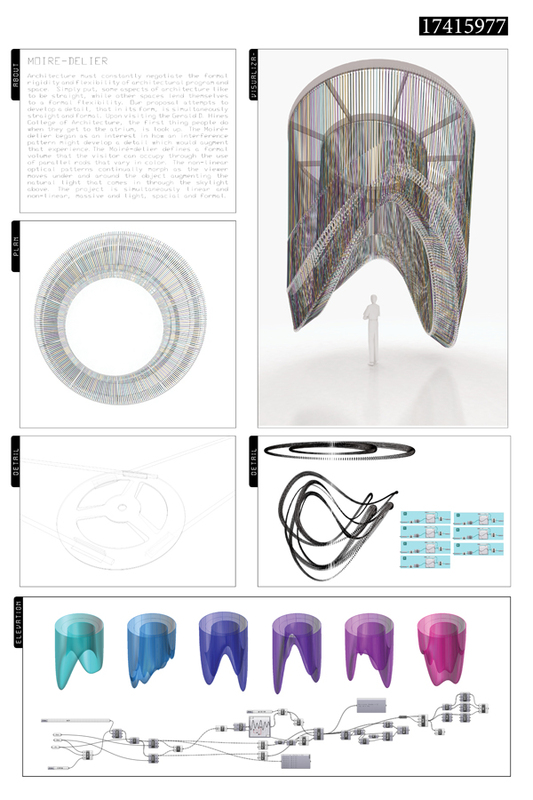 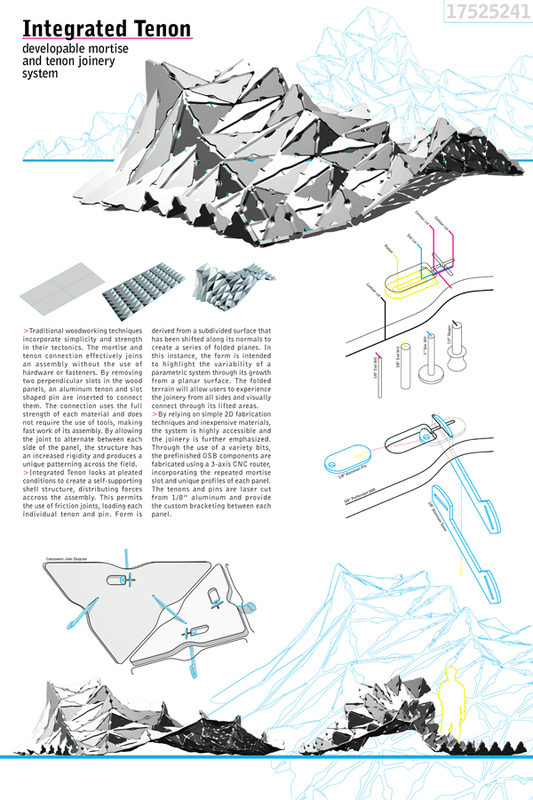 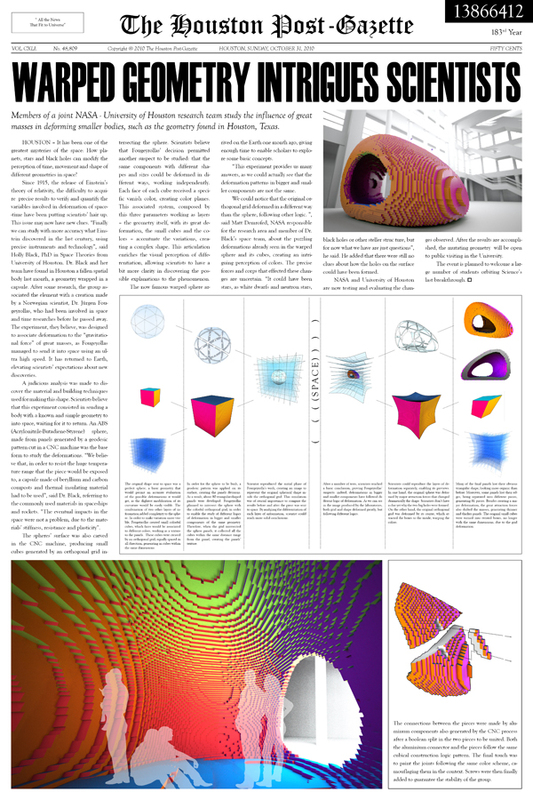 Our goal was to enable the role of digital fabrication and parametric design at the speculative level. 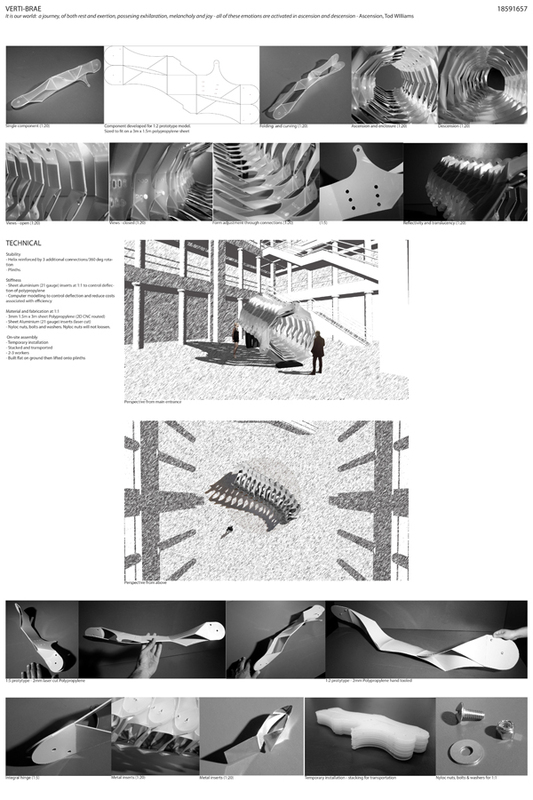 The jury conferred and selected 1 Winner, which is highlighted above, 4 Runners-Up and 7 Honorable Mentions which will be exhibited along side the winner at the REPEAT exhibition in Houston, coinciding with TEX-FAB 2 event. 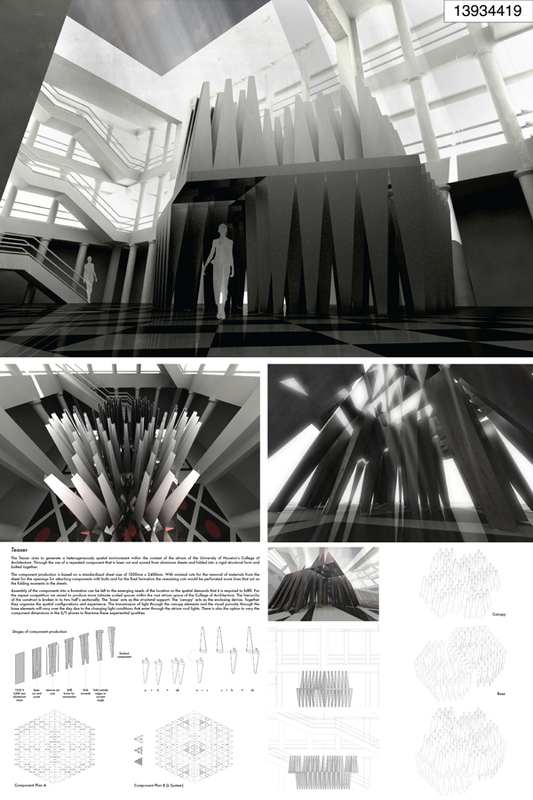 Vlad Tenu is a Romanian Architect based in London. 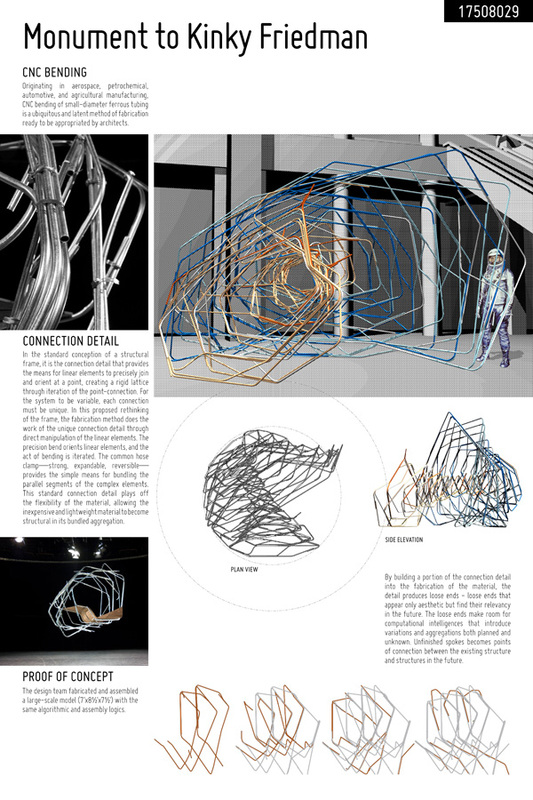 His ongoing research focuses on the integration of computation, science and technology in the architectural design process, involving generative computational methods, digital fabrication techniques and interactive design. 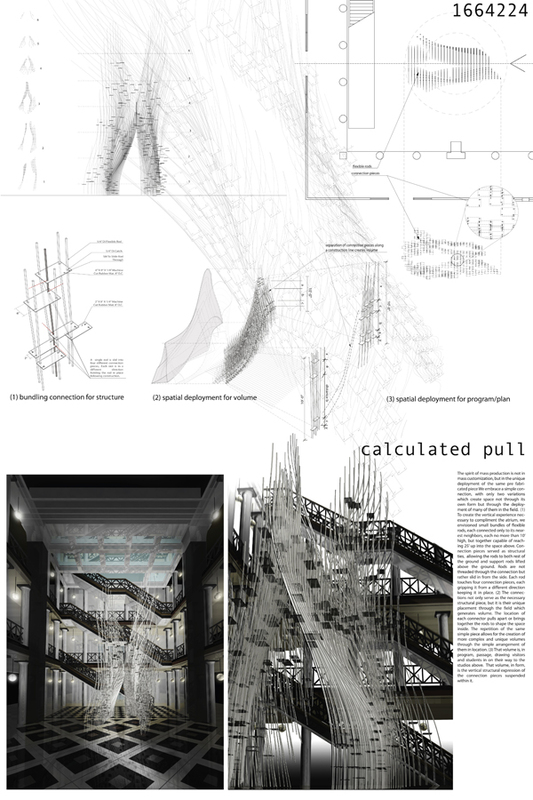 He studied architecture in Iasi, Lisbon and in London at the Bartlett, UCL, where he was awarded a Msc in Adaptive Architecture & Computation and a Certificate in Advanced Architectural Research. 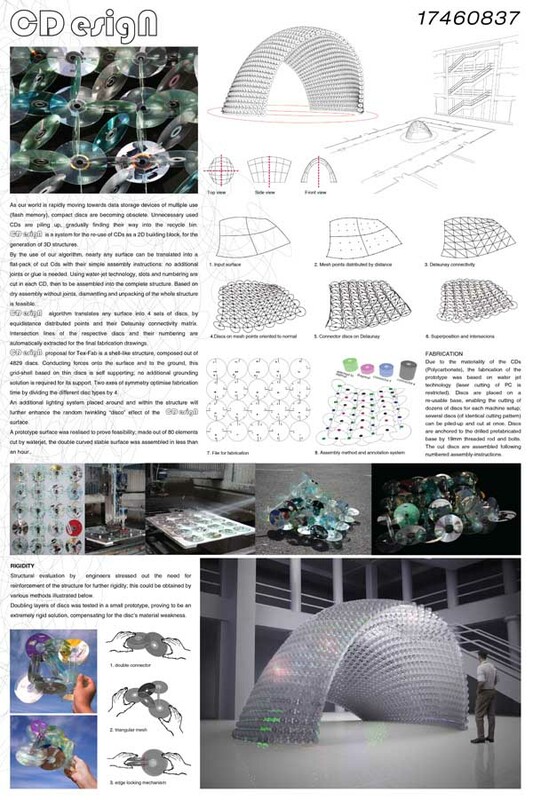 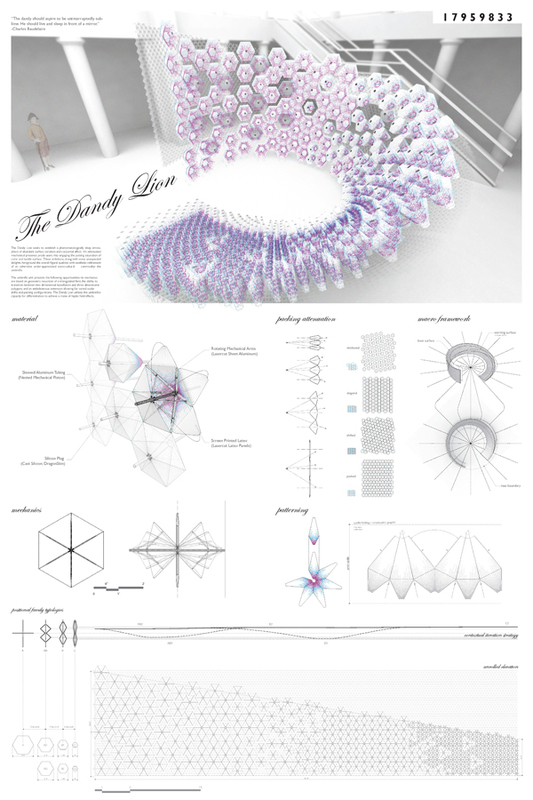 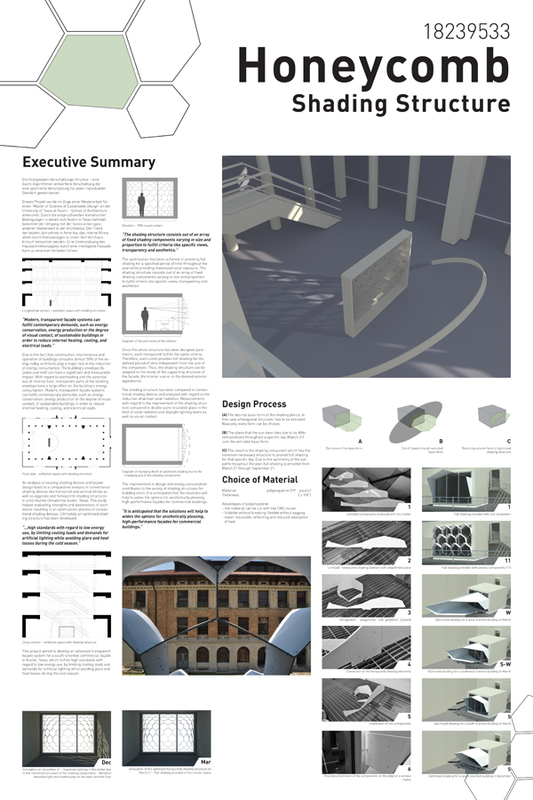 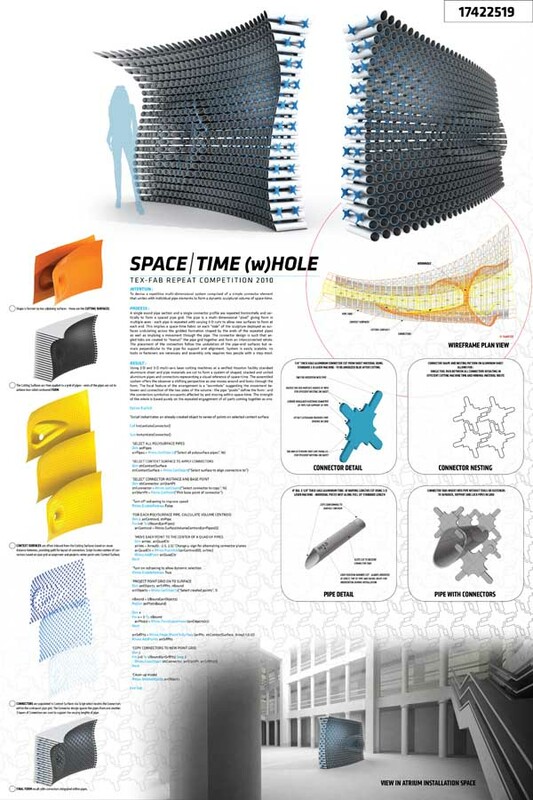 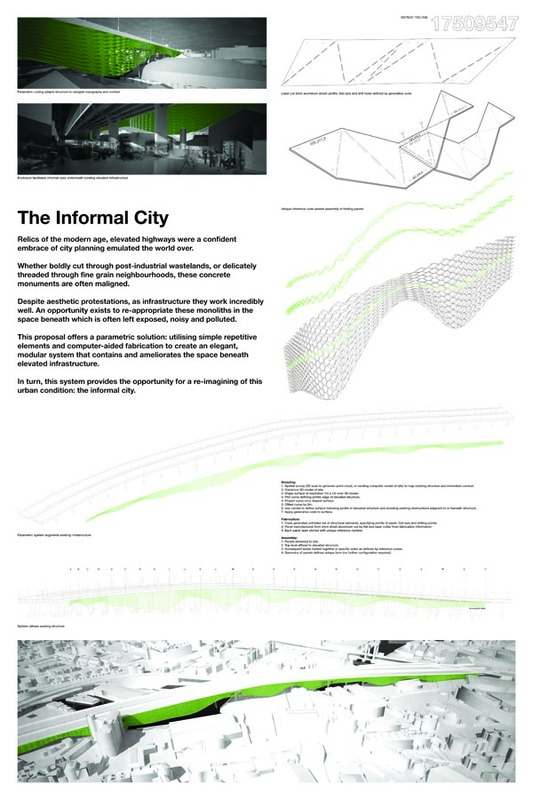 His latest project, ‘Minimal Complexity’ was exhibited for three months as part of Constructing Realities Exhibition at the ARUP Phase2 Gallery in London in summer 2010. 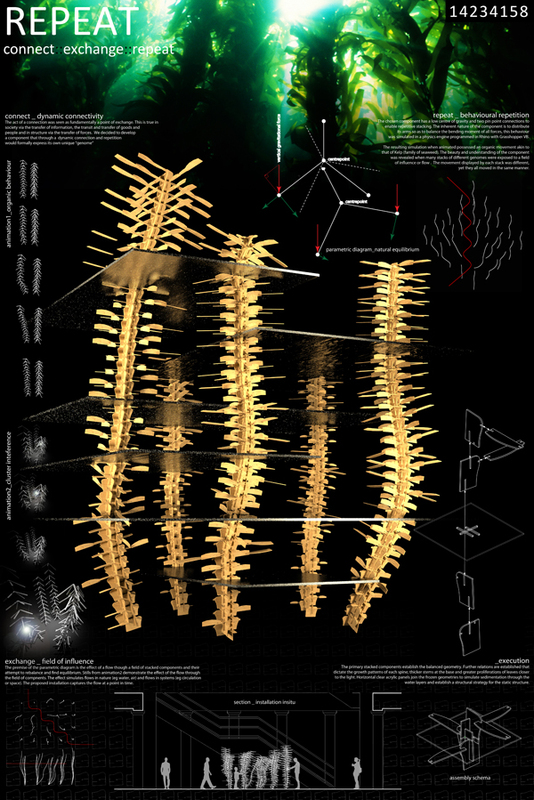 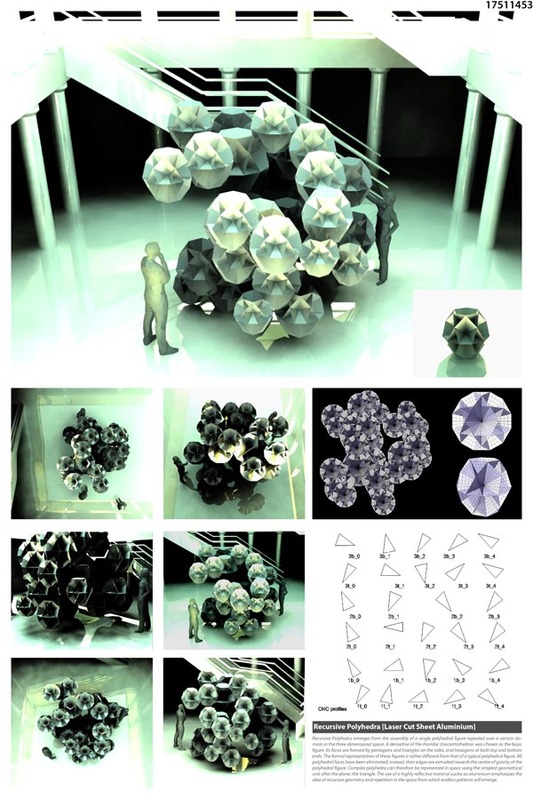 Additionally, Vlad presented a paper entitled ‘Minimal Surfaces as Self-Organising Systems’ at the ACADIA Conference which took place at the Cooper Union in New York in October 2010. 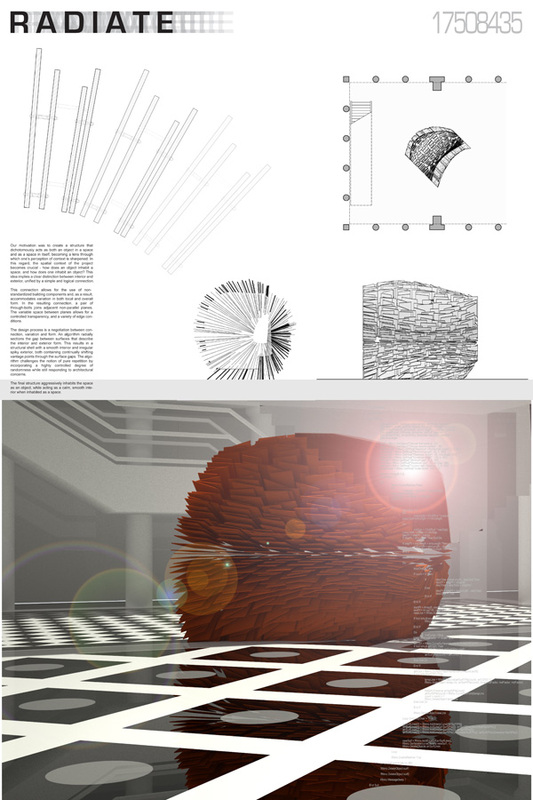 Vlad is involved in teaching at the Bartlett as an assistant for the Embodied and Embedded Technologies module within the Msc AAC. 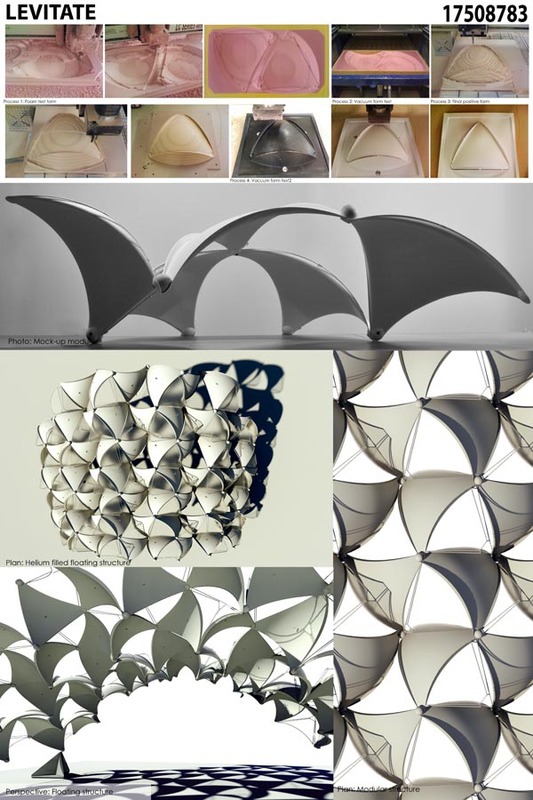 HIs professional experience covers a wide range of projects and competitions. 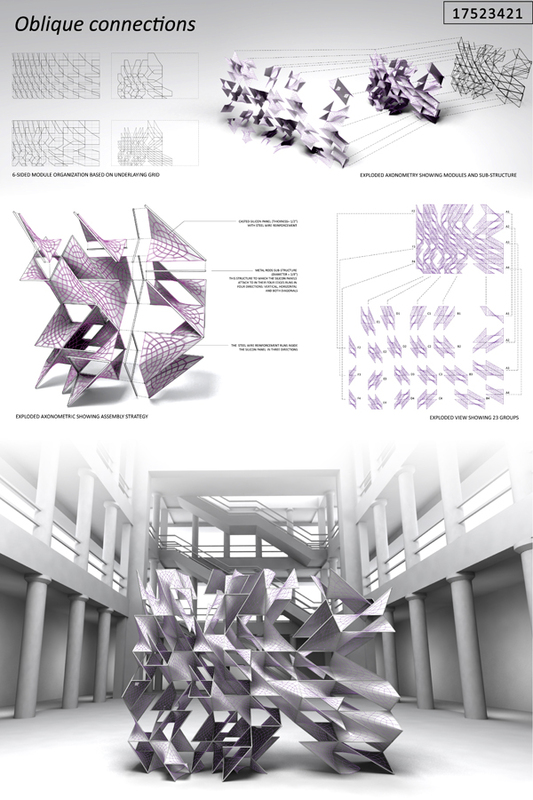 Currently Vlad is working with Surface Architects, an award winning design practice based in London. 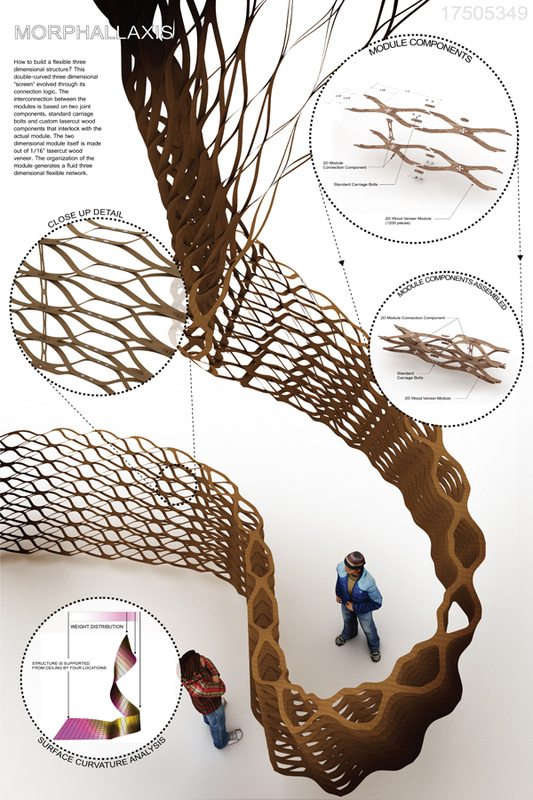 Upon graduating with distinction from the Graduate School of Architecture, Planning and Preservation at Columbia University, Christina Ciardullo and Naomi Ocko began collaborative research to explore their combined interest in fields, networks, systems, circulation, and tension. 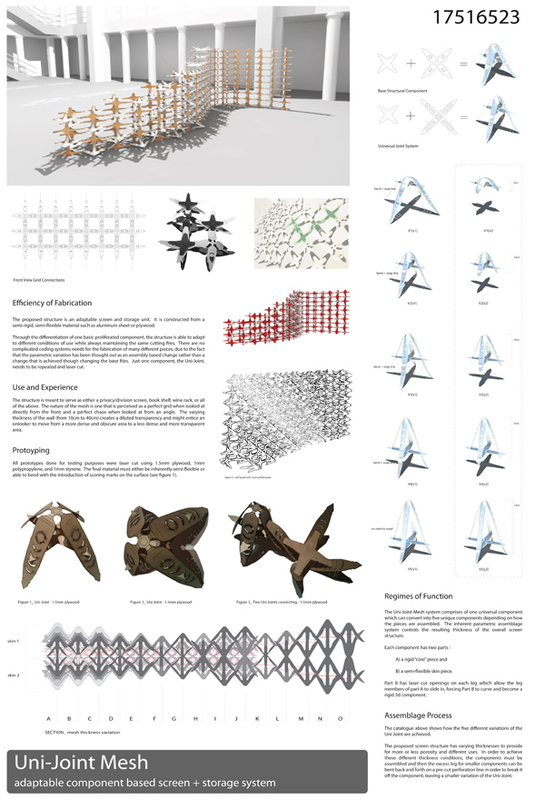 This experiment is one in a line of attempts to make material the space of these concepts – to produce a system of order and tension in architecture. 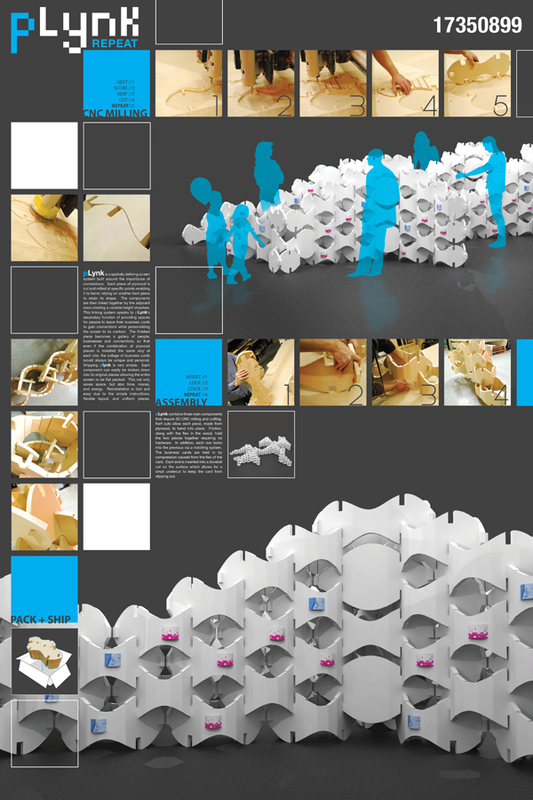 Clare Olsen received a Masters of Architecture with distinction from UCLA, and has since been practicing and teaching. 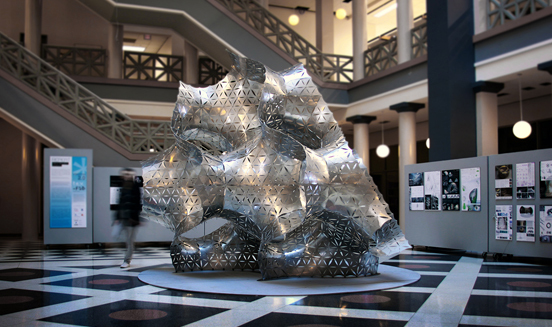 She recently completed a permanent installation on the Syracuse University campus entitled PROJECTions. 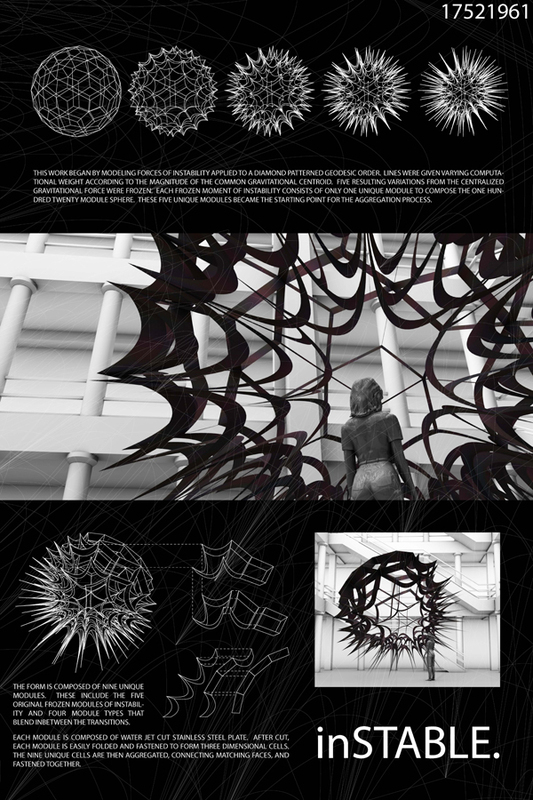 Olsen is a professor at Syracuse University where she teaches course work in design and media. 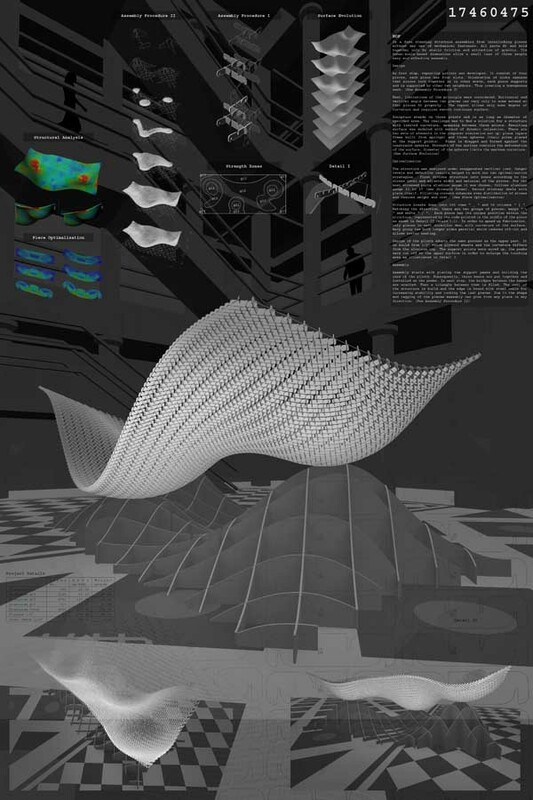 Vasilena Vassilev received a Master of Architecture degree from the Massachusetts Institute of Technology and is currently an Assistant Professor of Architecture at Syracuse University. 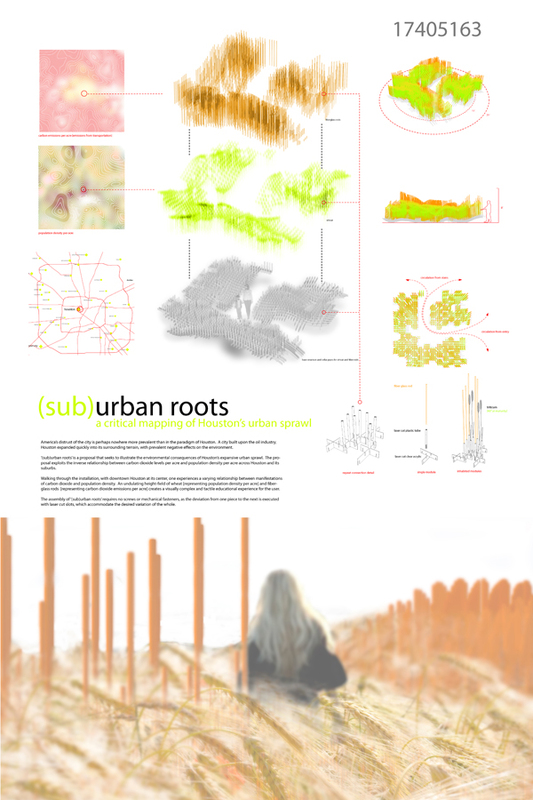 She teaches design studio and course work in urban ecology, addressing the role of design as it relates to current global system changes in politics, energy and the environment. 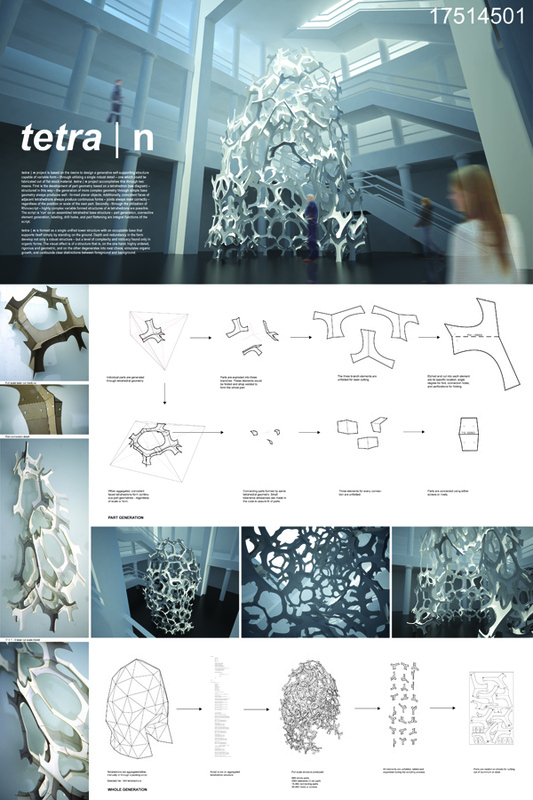 Péter Romvári is working for Atelier Peter Kis international award winning office for 2 years. 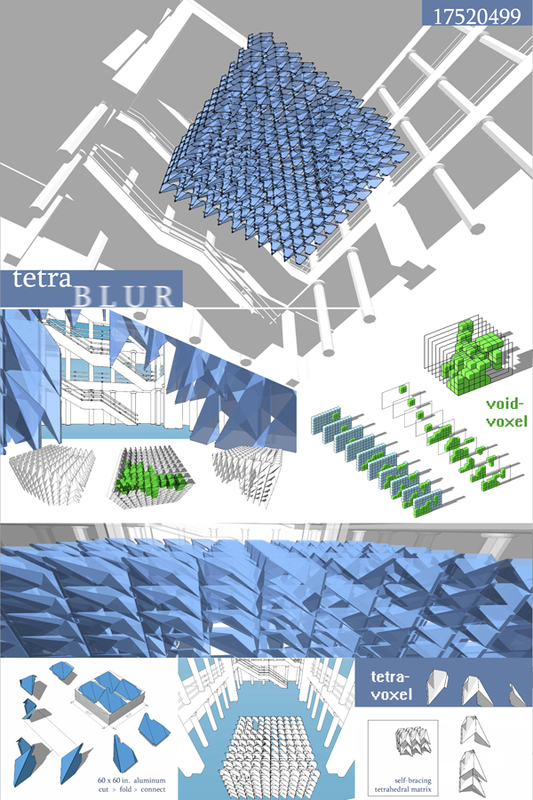 Peter is responsible for developing complex geometry, 3D modeling and visualization for commissioned building projects. 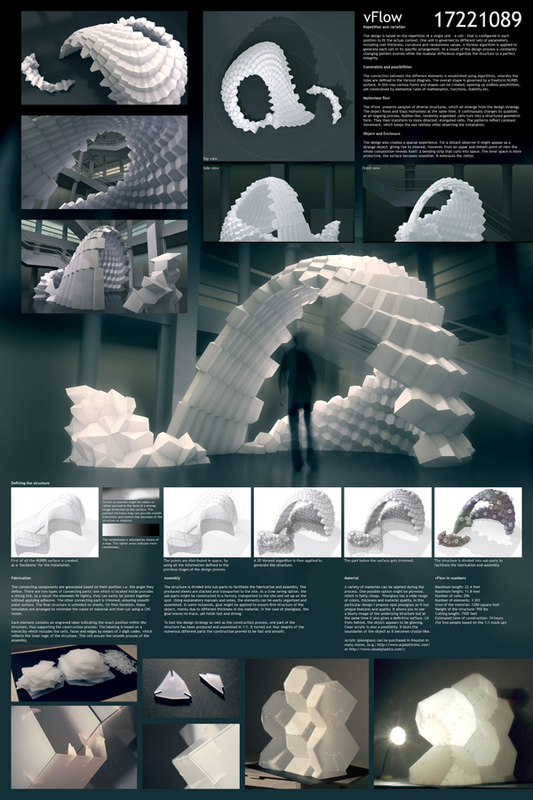 After Peter’s graduation, he worked one year in Kas Oosterhuis’ office in Rotterdam, the Netherlands. 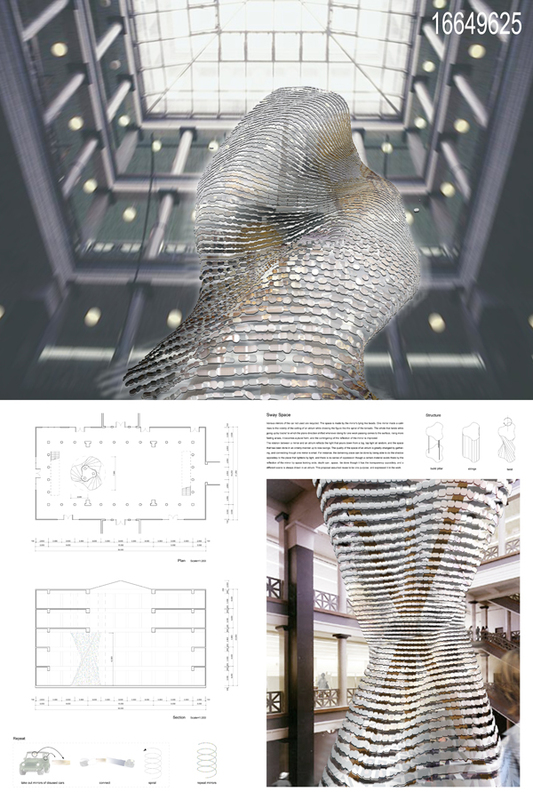 He was a member of the team who designed the CET, a cultural and commercial landmark building of Budapest. 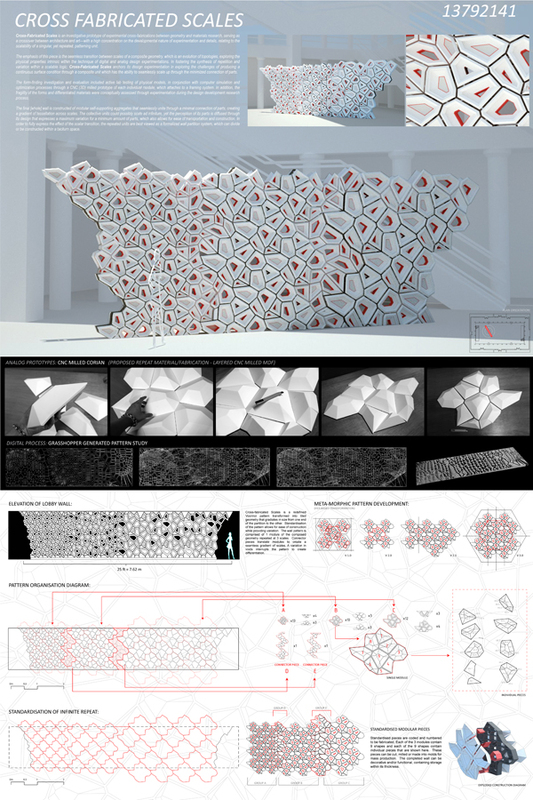 Before graduating as an architect at the Budapest University of Technology and Economics, Peter studied one year at l’École d’Architecture de Marseille-Luminy in France, and won a scholarship to Montevideo, Uruguay. 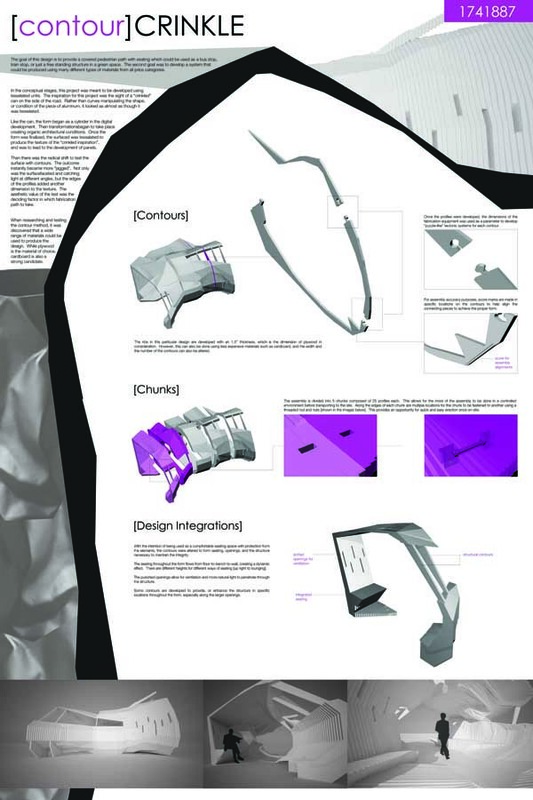 Glenn Wilcox & Anca Trandafiresc Glenn Wilcox is Assistant Professor of Architecture at Taubman College of Architecture at the University of Michigan, where he held the Muschenheim Fellowship in 1999-2000. 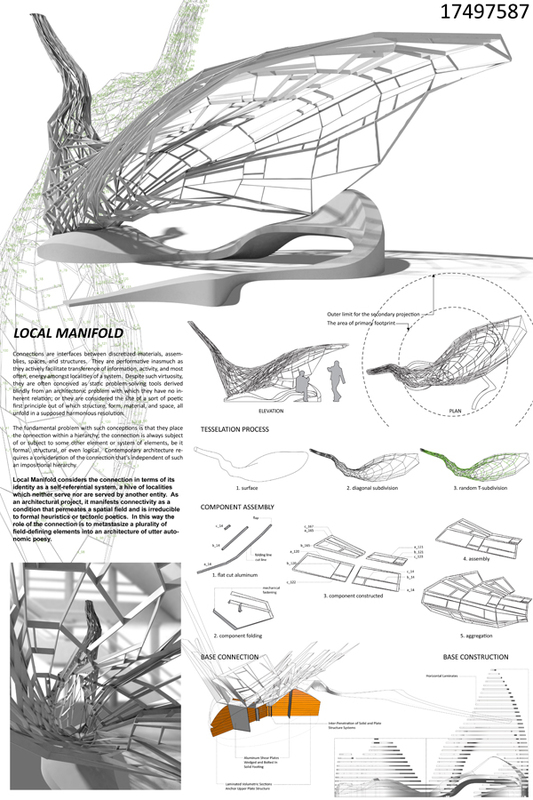 He has a B.Arch from Temple University and an M.Arch from Cornell University. 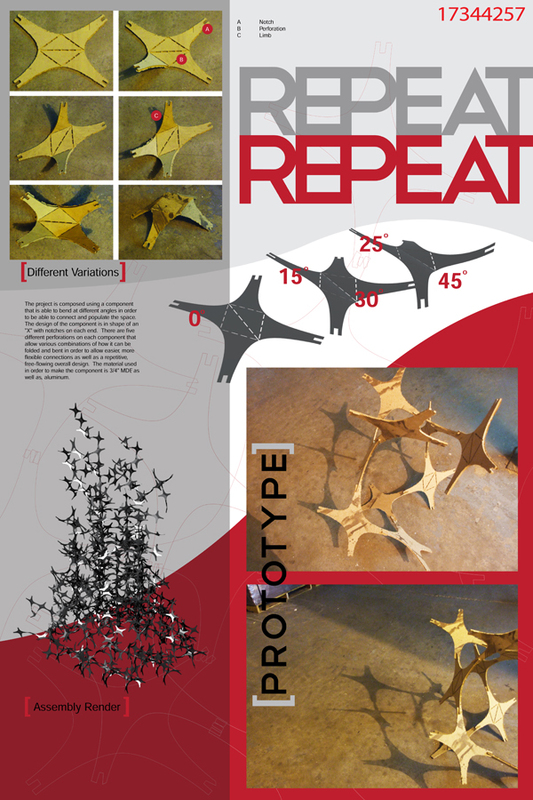 He teaches courses in design, geometric modeling, representation and digital fabrication. 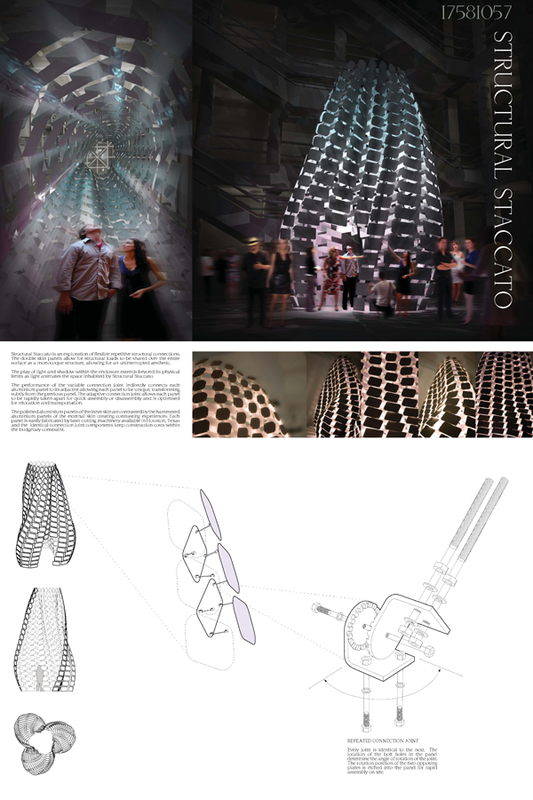 Anca Trandafirescu is an Assistant Professor in Architecture at The University of Michigan. 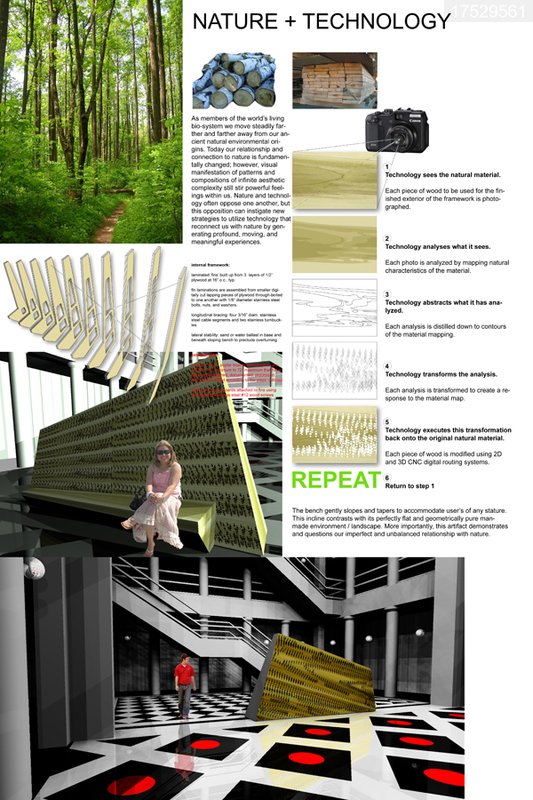 She held the Muschenheim Fellowship in 2005-2006. 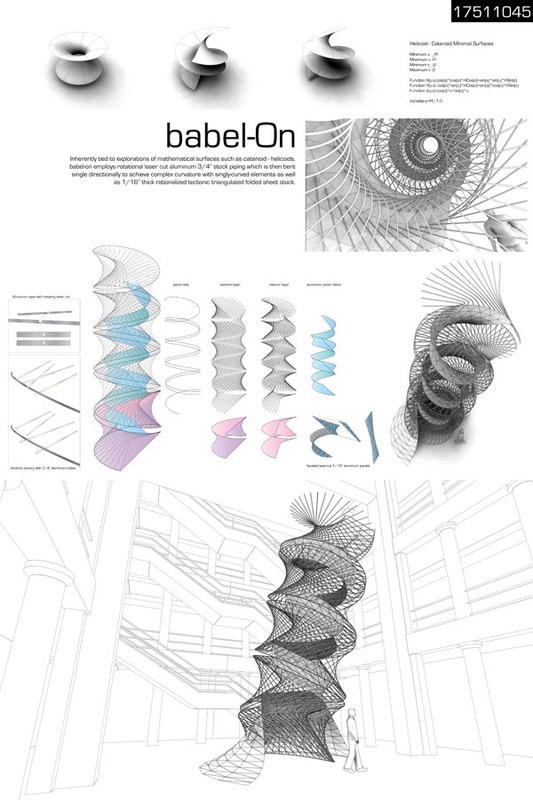 She has a B.Arch from Temple University and an M.Arch the Bartlett, University College London. 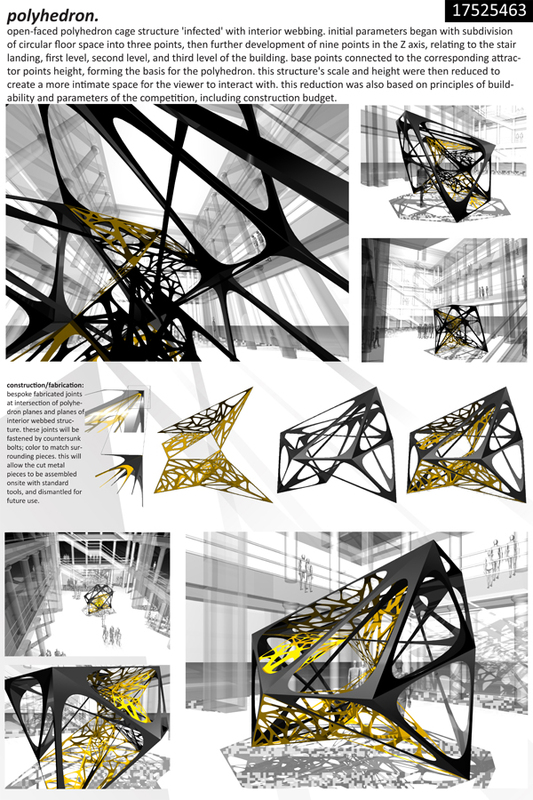 Anca teaches courses in design, theory, and representation and is a licensed architect in NY. 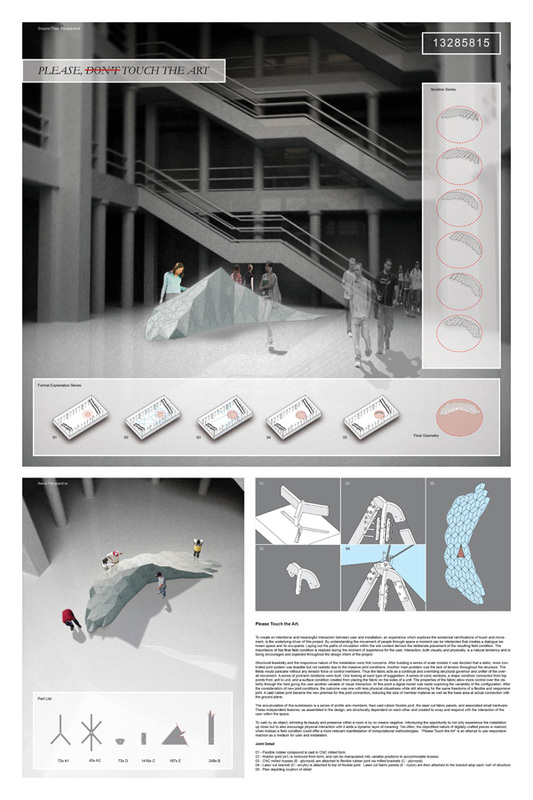 We received a total of 73 entries from across the globe representing 18 countries on 5 continents. 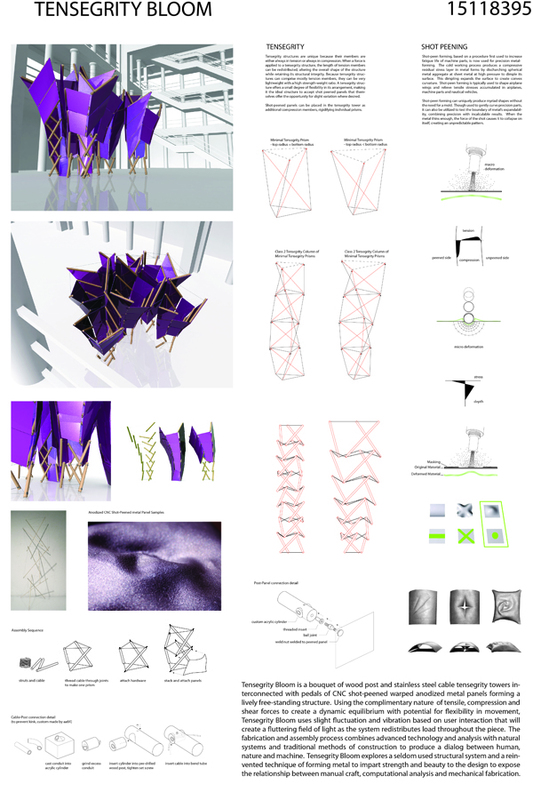 Below you will find the entire collection of submitted work, which you can view at a higher resolution once you click on the thumbnail.